Looking for Hanukkah themed gifts? These funny Chanukah t shirts and gifts are perfect presents for friends and the entire family, including the dog. These Happy Hanukkah t shirts, sweatshirts, jerseys, hoodies, hats, mugs, aprons, bibs, onesies and gifts are unique presents for Jewish family and friends. These Happy Hanukkah t shirts, sweatshirts, jerseys, hoodies, onesies, bibs, hats, mugs and aprons are unique Hanukkah gifts for Jewish family and friends. These cute I Love Chanukkah t shirts, onesies, bibs, hats, sippy cups and gifts are unique Hanukkah presents for Jewish babies and toddlers. These cute I Love Hanukkah t shirts, onesies, bibs, hats, sippy cups and gifts are unique Chanukah presents for Jewish babies and toddlers. 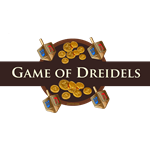 These Hanukkah Game of Thrones t shirts, sweatshirts, jerseys, hats, mugs and gifts are unique Hanukkah presents for Jews everywhere. Want to send a Hanukkah Chanukah greeting card? 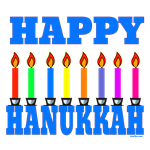 Send these Festival Of Lights cards to friends and family during Hanukah. Want a Hanukkah gift for a baby or toddler? 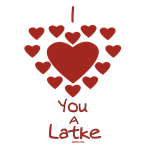 These I Love You a Latke t shirts, sweatshirts, bibs, onesies, hats and blankets are great gifts. Happy Challe Days with a loaf of challah is a great Jewish design on gifts of t shirts, mugs, arons, cards, hats, posters, bibs, and novelty gifts by Jewtee.com. Wear the greeting or give it. Want a funny Chanukah shirt or gift for your favorite male latke maker? These Real Men Make Latkes shirts, jerseys, hats, mugs and gifts are sizzling. Want a funny unique Hanukkah gift?This couch potato declaring I Wanna Be A Latke on t shirts, mugs, cards, mousepads, boxer shorts,posters, hats, and novelty gifts is great. These cute Happy Chanukah t shirts, onesies, bibs, hats, sippy cups and gifts are unique Hanukkah presents for Jewish babies and toddlers. Want a funny Chanukah shirt or gift for Jewish family and friends? These Make Latkes shirts, sweatshirts, hats, mugs and gifts are sizzling hot. Looking for a cute Hanukkah gift for babies, toddlers or kids? These colorful Born To Spin t shirts, sweatshirts, hoodies, onesies, hats, bibs and blankets are unique Chanukah presents. These My First Chanukah t shirts, onesies, bibs, pajamas and gifts are unique Hanukkah presents for Jewish babies and toddlers. Want a funny shirt or gift for Hanukkah? These Happy Challe Days shirts, pajamas, hats, mugs, aprons & novelty gifts are perfect Chanukah presents. What a great Jewish design this I WANNA BE A MACCABEE is on Hanukkah gifts of shirts, mugs, cards, hats, bibs, onesies, jerseys, boxer shorts and novelty giftsby Jewtee.com. Want a cute Hanukkah gift for kids? These Chanukah Dreidel Champ t shirts, sweatshirts, jerseys, hoodies, bibs, onesies and hats are winners. Want a funny shirt or gift for Hanukkah? These Dreidel Champ shirts, pajamas, hats, mugs, aprons & novelty gifts are perfect Chanukah presents. These Hebrew Happy Chanukah shirts, sweatshirts, hoodies, pajamas, hats, mugs and gifts are perfect Hanukkah presents. Want a cute Chanukah shirt, bib, hat, onesie, or hoodie for a Hanukkah present for a Jewish baby or toddler? Buy Little Lake Lover. Want a funny Chanukah shirt or gift for Jewish family and friends? These Got Latkes shirts, sweatshirts, hats, mugs and gifts are sizzling hot. Want a funny Chanukah shirt or gift for your favorite latke eater? These Real Men Eat Latkes shirts, jerseys, hats, mugs and gifts are sizzling. Want a funny Hanukkah shirt? These Baby Light My Fire t shirts, sweatshirts, jerseys, hats, mugs and gifts are perfect presents for Jewish family & friends. Want a funny Chanukah shirt for the kids? These Eight Nights of Chanukah t shirts, sweatshirts, hoodies, onesies and bibs are truly royal Hanukkah gifts. Want a cute Chanukah gift for Jewish friends with young kids or babies? These Mommy's Little Latke bibs, onesies, shirts, hoodies and blankets sizzle. Want to buy a Hanukkah gift for a Jewish baby? These My First Hanukkah onesies, bibs, and t shirts are unique Chanukah presents for Jewish infants. Want to buy a Hanukkah gift for a new jewish baby? These My First Hanukkah Dancing Dreidel t shirts, sweatshirts, blankets,onesies and bibs make a unique Chanukah present. These My First Chanukah bibs, onesies, hats, t shirts, blankets and other baby gifts are perfect Hanukkah presents for Jewish family and friends. Want a funny shirt or gift for Hanukkah? These Keep Calm Dreidel On shirts, pajamas, hats, mugs, aprons & novelty gifts are perfect Chanukah presents. Want a funny shirt or gift for Hanukkah? These Dancing Dreidels on shirts, pajamas, hats, mugs, aprons & novelty gifts are perfect Chanukah presents. Want a funny shirt or gift for Hanukkah? These Head Spin Dreidel shirts, pajamas, hats, mugs, aprons & novelty gifts are perfect Chanukah presents. Looking for a funny Hanukkah shirt or gift? Check out these Got a Light Chanukah t shirts, sweatshirts,hats, mugs and novelty gifts. Looking for a unique Chanukah shirt or gift? These Happy Chanukah Dreidel shirts, sweatshirts, jats, mugs and gifts are perfect Hanukkah presents. What funny Hanukkah gifts of shirts, hats, mugs, throw pillows, aprons, posters, tote bags, magners, and Jewish novelty gifts these are with this menorah design of I Got Lit At The Hanukkah Party. These funny Hanukkah I Wanna Be A Latke Jewish t shirts, aprons, mugs, posters, bibs, magnets, and novelty gifts are perfect Chanukah presents. Need an original Hanukkah gift of a Jewish t shirt, mousepad, poster, hat, mug, tote bag, card, magnet, maternity shirt, or just a special Shalom Y'all dreidel? Buy this! This Yiddish Got Gelt design is funny on Hanukkah gifts of shirts, hats, mugs, bibs, cards, aprons, onesies, t shirts,magnets, ornaments, and novelty gifts. Looking for a funny Hanukkah gift? These Eight Knights of Chanukah t shirts, jerseys, hats, mugs and gifts are unique Holiday presents. Latke Lover is a tasteful Jewish design for the food mavens for Chanukah and all year. 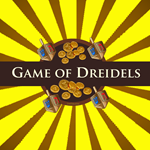 Want to go for the Jewish green?This Festival of Lights Hanukkah design, Yiddish Dreidel Meidel, is sure to turn heads on t shirts, bibs, onesies, and novelty gifts. Want a unique Hanukkah gift for the Jewish kids or grandkids? These Cute Got Driedels t shirts, bibs, onesies, sweatshirts, hoodies, hats and blankets are great Chanukah gifts. A sense of Jewish humor will help you appreciate this I Wanna Be A Macabee Macaroon design on Hanukkah gifts-bibs, t shirts, aprons, cards, jerseys, posters, boxer shorts and novelty gifts by Jewtee. This Chanukah design Got Dreidels on Hanukkah gifts of shirts, bibs, onesies, sweatshirts, throw pillows, hats, mugs, cards, and novelty gifts should delight all. This funny Jewish design Got Gelt is asking for money. Do you have some? 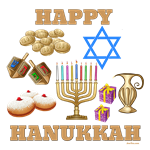 This design Hanukkah Bush with the President of the United States lighting a menorah is a funny patriotic image on Hanukkah gifts of shirts, hats,mugs,mousepads,tote bags,t shirts,cards& more. This Hanukkah Dreidel Spinsta design makes a funny Jewish gfit and t shirt. Celebrate Chanukah 2007 with a jersey, mousepad, hat, mug, card, or novelty gifts. What a humorous religious gift! Want to give a funny Chanukkah present? These Light My Fire t shirts, sweatshirts, bibs, mugs, hats, tote bags, boxer shorts, aprons, cards, and novelty gifts will delight all. These funny Oy To The World shirts, t shirts, sweatshirts, hats, mugs, buttons and novelty gifts featuring former Pres. Obama are a unique Hanukkah or anytime gift. OY to the world is a funny message that will bring joy to the world who see it on t shirts, mugs, bibs, jerseys, sweatshirts, cards, and novelty gifts. This has alot of Jewish humor. This colorful SPIN DOCTOR should bring a smile to you and your friends and family. You can get well when laughter is the best medicine. This Hanukah Jewish design The Grateful Latkes is a special Hanukkah gift on t shirts, bibs, onesies, posters, jerseys, aprons, boxer shorts, dog shirts, and novelty gift by Jewtee.com. Looking for a funny Chanukah Hanukkah gift for your wife or lady friend? These I'm Hot t shirts, sweatshirts, hats, mugs, aprons and novelty gifts will make that special lady feel appreciated. Looking for a funny Chanukah Hanukkah gift for your wife or lady friend? These Hot Latke t shirts, sweatshirts, hats, mugs, aprons and novelty gifts will make that special lady feel appreciated.